A £17 drop in entitles you to one hot yoga class or one Yin yoga class. From purchases date you have one month to use this class. If you purchase Drop In classes online they can only be used by you! To buy them for another person, please use our gift card option to credit the recipient’s account. Concession Price £15*. Only available at studio. 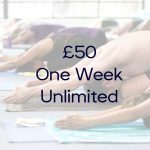 If you practise anywhere from 1 class every 2 weeks to 2 classes a week then the 10 class card valid over 6 months us the perfect card for you and at only £125, you are saving £4.50 per class.